Guesthouse No: 1 The Esplanade Guest Accommodation. Lock in a great price for No: 1 The Esplanade Guest Accommodation. – rated 8.6 by recent guests! Brilliant location, staff were nice, views were beautiful from the room I was in. Only downside was the fact we wasn't staying longer and the weather wasn't sunny the first day but still warm but that's out of anyone's hands. Lovely stay would recommend. The staff was very accommodating and helpful. The breakfast was delicious. The sea view room was decent with breathtaking views of the beech. I had booked months in advance for a small single room but when I arrived I was told that that room had some plumbing that needed repair so they simply upgraded me free of charge to the posher ocean view room with jacuzzi tub. I am sure the single would have been nice too. Great location just outside the city walls along the beach. The location is unbeatable as hotel is right on the ocean and it's quite clean. The staff are very friendly and helpful. The breakfast was also very nice. Breakfast was freshly cooked to order and was very good with a choice of dishes and you could change things for what you wanted on the plate. The welcome and all the staff were very friendly and helpful. The location is excellent, the place is nice as are the staff, especially the owner. The rooms could you a touch of updating, good value, good breakfast. Loved the character and coziness of my little loft room (Room 32) and the wonderful view, slightly spoilt by the temporary scaffolding as building work takes place. And the great breakfast in a delightful breakfast room. Fantastic location overlooking South Beach and very close to the walls. Free on-street parking was a fabulous bonus. Great location with a great view. The breakfast restaurant is set up really nice, the breakfast itself was brilliant. The staff were friendly and the owner a nice guy. Graham-the owner-was charming and pleasant;apologetic about the scaffolding.Cooked a lovely breakfast. No: 1 The Esplanade Guest Accommodation. This rating is a reflection of how the property compares to the industry standard when it comes to price, facilities and services available. It's based on a self-evaluation by the property. Use this rating to help choose your stay! 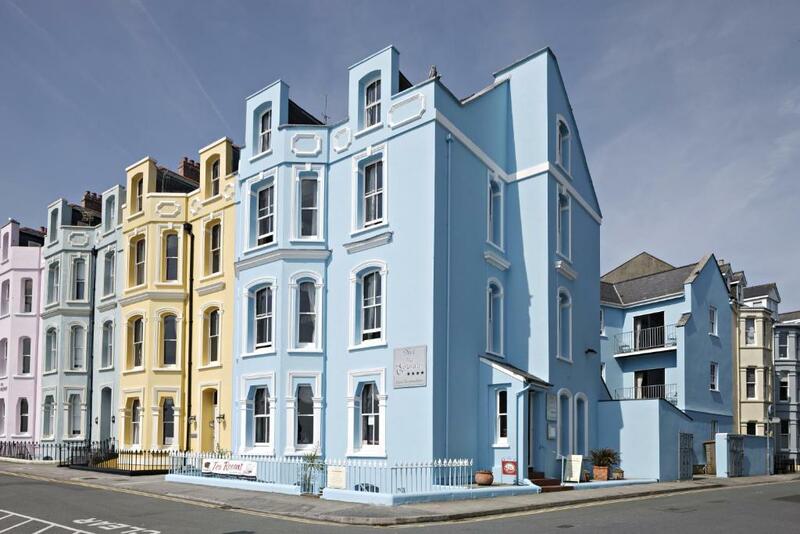 One of our top picks in Tenby.Overlooking South Beach in Pembrokeshire Coast National Park, The Esplanade offers cooked breakfasts and traditional bedrooms with free Wi-Fi. The Esplanade has wonderful sea views out over Carmarthen Bay. The cozy rooms at The Esplanade are individually decorated and each has a private bathroom. All rooms have a TV, hairdryer, telephone and tea and coffee facilities. Some have four-poster beds and impressive views. Full English breakfasts are served daily in the spacious dining room, with light continental options also available. The Esplanade has a well-stocked bar, offering a range of beverages and snacks, and there is a range of restaurants just a short walk away. 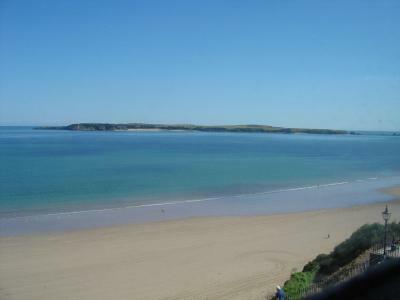 With direct access to the sandy beach, The Esplanade is in Tenby, just a 10-minute walk from Tenby Train Station. 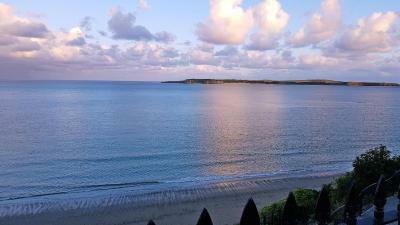 Pembroke center and Pembroke Docks are a 20-minute drive away, and Saundersfoot is a 10-minute drive away. When would you like to stay at No: 1 The Esplanade Guest Accommodation.? Includes an private bathroom and facilities for making tea and coffee. 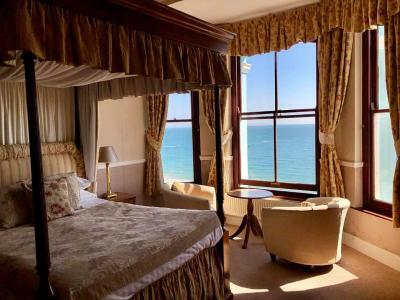 With a four-poster bed and sea views. 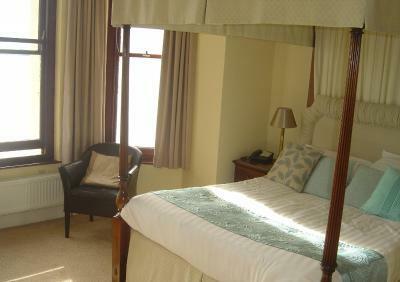 With sea views, this room includes an private bathroom and facilities for making tea and coffee. This family room has a balcony with partial sea views, a sofa and tea and coffee making facilities. 5 reasons to choose No: 1 The Esplanade Guest Accommodation. Facilities of No: 1 The Esplanade Guest Accommodation. House Rules No: 1 The Esplanade Guest Accommodation. takes special requests – add in the next step! No: 1 The Esplanade Guest Accommodation. accepts these cards and reserves the right to temporarily hold an amount prior to arrival. See all guest reviews for No: 1 The Esplanade Guest Accommodation. Newest Reviews for No: 1 The Esplanade Guest Accommodation. Close to the beach as town centre. Nothing. There was nothing about the place that we could fault. Friendly family run, someone always available to help. Excellent choices for breakfast, good to see a place that offers a single room. Both rooms (Double & Single) were of a good size for what we wanted with comfortable beds. Location has easy access to large open air car park (street parking is permit only) and the town centre. The room was tired and needed a refresh throughout ! Before we arrived we received an email saying that there was going to be scaffold up which might spoil the view of the sea, on arrival yes there was scaffold up !! But they failed to tell us that the windows would be open and not be able to close ! This was remedied by the staff that just gaffer taped plastic bags to the openings and hoping for the best! Then Turing the heating off at 2100 hrs so when we came back to the room at 2300 hrs the room was colder that outside and windier !!! 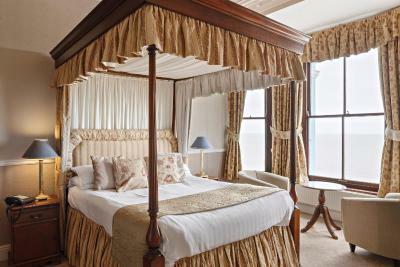 The four poster bed !!! The breakfast. My partners was cold and I found two hairs in mine so we skipped breakfast on the second morning.. Shower was always cold and toilet could of done with a dusting. No wi fi in the room. Pity about scaffolding as it obscured the view.Had to find a parking place. Very nice friendly owner, super location , excellent breakfast . Room was clean, very good location,breakfast was nice, staff was friendly and they are pet friendly. The breakfast was superb and the location perfect.